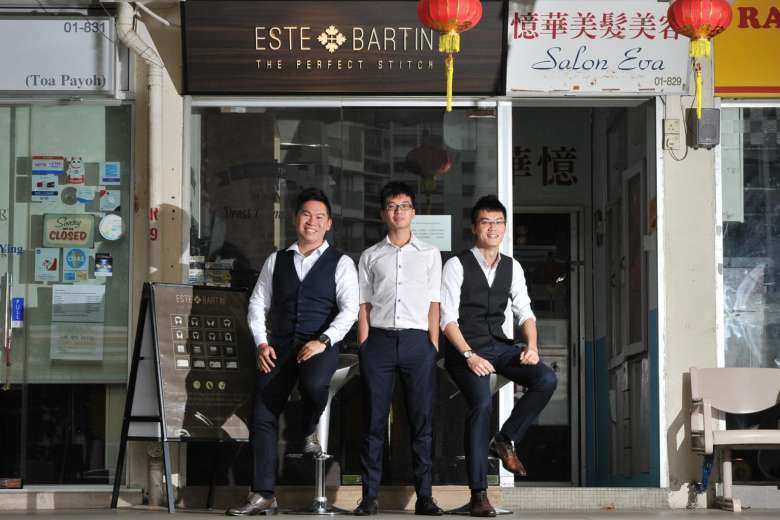 (Photo taken from The Straits Times on site) Owners of tailor shop Este Bartin, Justin Loy (right), 33, and Barry Lim (left) , 35, together with their employee, Benedict Teo (center), 23, at their boutique in Toa Payoh. Walk into any HDB mom-and-pop shop and chances are there will be an elderly uncle or auntie behind the counter. The heartland enterprise scene is often associated with old shopkeepers plying traditional trades such as sundry stores and medical halls. But this is morphing as a younger generation enters the scene. Their average age is 48, down from 50 five years ago, said the HDB. And many of them are breathing new life into the heartlands by setting up cafes, ice-cream parlours and gentleman barber shops.